More than half of Americans are trying to lose weight at the moment, and this is the main reason why we see so many weight loss programs on the market. The promise of fast and effective weight-loss seems tempting, but is this possible in real life? If weight-loss programs worked, then logically, there wouldn’t be such a high number of people struggling with excess body weight. Instead of successful weight loss, what most people experience with these diets is the yo-yo effect. Other than sheer disappointment, yo-yo dieting also leads to a host of health problems. In case you were wondering how exactly yo-yo dieting is bad for your health and how a popular diet called the low-carb diet could prevent the yo-yo effect, then keep reading. Yo-yo dieting is known in the medical community as weight cycling. It refers to the rapid weight gain followed by weight loss of several pounds in a short span of time. The phenomenon is very common with most people trying to lose weight experiencing it at some point. Survey data shows that 17% of people trying to lose weight are also severe weight cyclers while 30% of people were moderate weight cyclers. When adding these numbers together, you get more than 50% of people attempting to lose weight that go through what is known as weight cycling. So, as we can see, successful weight loss is not easy, and half the people are trying to lose weight experience it coming back after initial success. Finding the best diet plan to lose weight is tough, and you should consider the possibility of your weight returning after initial success. The problem with yo-yo dieting is that it seems to be much more confusing to the body than when you remain overweight for most of your life. What is even more concerning is that studies show that dieting can lead to greater weight gain when not done properly. A study published in the British Journal of Nutrition found that dietary restraint increases a person’s risk of weight gain. The main reasons for this being metabolic changes caused by dieting and binge eating. Our body likes to hold on to its fat reserves. So, any time you restrict your calorie intake, the body will make metabolic adaptations such as lowering resting metabolic rate and wasting muscle tissue before it will turn to fat reserves. These things all lead to easier weight gain following a bout of starvation. Research has long found a strong link between yo-yo dieting and increased blood cholesterol and triglyceride levels. For instance, one study found that women with normal weight who’ve been weight cyclers for a part of their life had a three time greater risk of sudden cardiac death than women with stable weight. 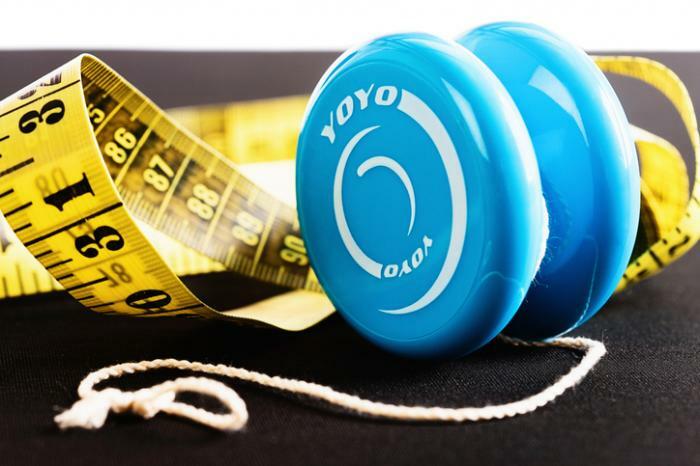 The same research noted a 66% increased risk of coronary heart disease from yo-yo dieting. The exact mechanisms behind this are unknown but may have to do with DNA damage caused by this type of dieting. People with relatively normal weight who go through weight cycling do not have the same adaptive mechanisms to weight changes, and this is the main reason why yo-yo dieting leads to heart disease in this group said the study’s lead author Somwail Rasla, MD, at Memorial Hospital of Rhode Island and Alpert Medical School of Brown University. Being overweight and obese is now recognized as an inflammatory disease. Adipose tissue is an organ that becomes inflamed with excess fat accumulation. Overweight individuals are known to have greater markers of inflammation in their body as a result, and this increases their risk of chronic diseases. This is one reason why overweight people are encouraged to lose weight. But now, research shows that losing and gaining weight in cycles through yo-yo dieting may cause even greater whole-body inflammation than when a person remains the same weight. Inflammation in the body is associated with systematic diseases, cancer, depression, autoimmune disorders, and even memory problems. If you were wondering how to reduce your risk of these diseases or how to improve memory, then steer clear of yo-yo dieting. For those seeking fast and effective weight loss, there are many alternatives that were approved by medical experts. A good example is a low-carb diet which became increasingly popular ever since the WHO recommended that people reduce their consumption of sugar and starches for better health and weight loss. Diets low in carbohydrates lead to a process called ketosis, where your body uses fat stores and turns body fat into ketone bodies which are essentially a substitute for glucose. The result is rapid weight loss but without the risk of the yo-yo effect. In addition to this, most low-carb diets recommend a higher intake of fat. Although this can seem counterintuitive when trying to lose weight, the truth is that fat increases your satiety and is higher to digest than carbs, so there’s no danger of fast weight gain with a low-carb but moderate fat diet. The efficiency of this diet in inducing rapid and effective weight loss was even confirmed in a recent study published in The British Journal of Nutrition. With so many people trying to lose weight, the risks of weight loss become even higher. Although weight-loss is important for overweight people in improving their overall health and well-being, the risk of the yo-yo effect is far too real. Yo-yo dieting is associated with even worse health outcomes than being overweight. Developing a careful diet strategy is one way to avoid rapid weight regain following weight loss. Sticking to moderate and slow weight loss may be your best option if you need to shed some pounds. A good way to do just that is with a low-carb and moderate fat diet which was scientifically-proven to buffer the yo-yo effect. Speaking to a nutritionist may also help avoid adverse health outcomes. Keep in mind that your body does not like the idea of giving away fat reserves and that weight-loss comes after careful manipulation of the body’s metabolism.